Beautiful Hairstyles For The Bride To Be. Now that we’ve covered just about everything that would transform you into the perfect bride that you’ve always wanted to be, let’s come down to that one thing that will give an edge to your bridal glory. Neither does this one bridal hairstyle fail to amaze everyone nor does it go out of fashion. Just grab your hair at the back and put them into a braid or a simple bun hairstyle. 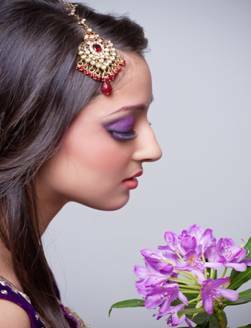 Use fresh mogra flowers (gajra) and a mang tikka for jewellery to adorn your hair. You can also cover your head with a veil depending on the traditions. One of the most elegant and classy hairstyles, the jewelled tiara look is capable of turning a lot of heads. Add volume to your hair by wearing your hear in a puff around the crown area and create a bun at the back with the remaining hair. Put on a stylish stone studded tiara around the crown, just before the puff and get ready to dazzle. If you’re looking for a simple and graceful hairstyles for long hair to go with your cocktail dress, follow these steps. Create a small pouf at the top by separating a thin section of hair at the front. Make a high updo out of this section by pulling it back. Now, curl up the front bang softly, secure it into your pouf and voila! For those who like stylish classic hairstyles for long hair that are bound to make you look magnificent, this one is the real deal. A couple of twists, a few pins, and you’re done. For occasions where you need to keep your hair stylish, just curl your hair at the back in loose curls, and tie the front-half of the hair in a small voluminous puff. And you’re good to go! When it comes to hair styling for the D-day, buns reign supreme. To make sure that you get your bun right, just follow these hair care tips - create a puff around the crown by leaving out the front section of your hair. Not only will this add some volume to your look but also add a few inches to your height. Make a simple bun around the nape of your neck with the rest of your hair and decorate it with simple accessories.